The Old Hall01263 715779work01603 870304fax Self-cateringThe Old Hall, a spacious house in the coastal village of Happisburgh, pronounced 'Haisbro', in North East Norfolk, is close to the beach. The market towns of Stalham and North Walsham are a short drive away and the Broadland town of Wroxham with its boat hire is only twelve miles away. • Other: Bed linen, towels, travel cot provided, WiFi. View across the fields to Old Hall Cottage. 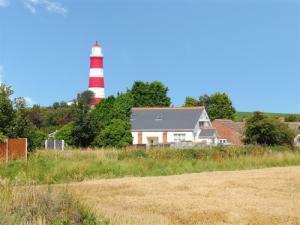 The property is nestled in the trees with Happisburgh Lighthouse in the background near to the property. The Old Hall, a spacious house in the coastal village of Happisburgh, pronounced 'Haisbro', in North East Norfolk, is close to the beach. The market towns of Stalham and North Walsham are a short drive away and the Broadland town of Wroxham with its boat hire is only twelve miles away.